Alana Spencer has been a client of ours ever since she won BBC's The Apprentice in 2016 and asked us to design a new website for her handmade cake business, Ridiculously Rich by Alana. 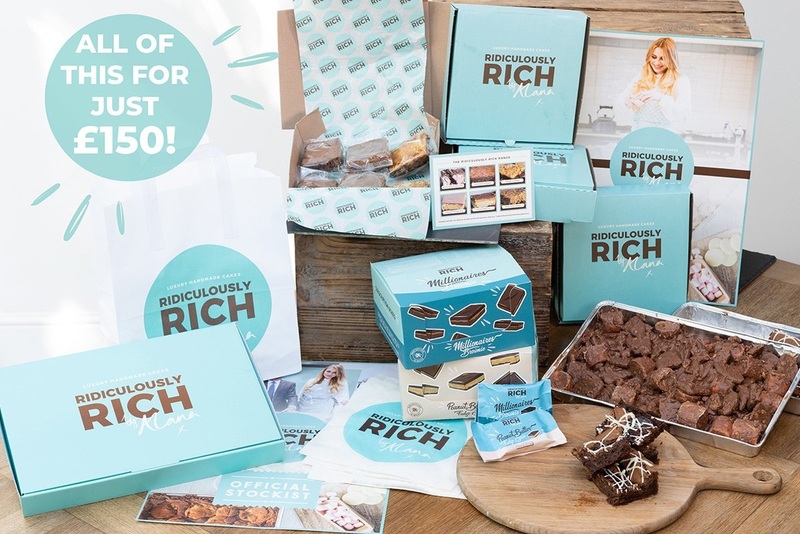 Ridiculously Rich has been going from strength to strength since Lord Sugar invested in the company two years ago, and earlier this week, he and Alana announced their new Cakepreneur initiative, which promises to drive even greater growth as we head into autumn. The Designer Websites team have been hard at work over the last couple of weeks, striving to ensure that the website's new Cakepreneur system would be ready for its big launch. We were asked to build an add-on for Alana's existing Ambassador system to accommodate a new type of reseller: Cakepreneurs. This was conceived as a more affordable way to join the Ridiculously Rich family - it costs £1,000 to become the Ridiculously Rich Ambassador for your region, whereas Cakepreneurs pay a one-off setup fee of just £150. A Ridiculously Rich Cakepreneur starter kit. Our skilled web developers created a sign-up area that makes it easy for would-be Cakepreneurs to get the ball rolling. Once the user has filled in their details, the website shows them an introductory video, then prompts them to take a quick online test. Those who pass this test can then pay the setup fee and order their starter kit (pictured above). ...and so on. Each Cakepreneur is given a unique discount code that entitles their customers to 5% off all online orders. The system that we have designed and developed makes it easy for Alana's Cakepreneurs to sign in and manage everything. Each Cakepreneur can create their own Ridiculously Rich profile, add meetings to their own personal calendar, and sign up clients who will earn them commission with each order placed. The system also allows the Ridiculously Rich administrators to see how active each Cakepreneur is. A new downloads section that allows Ridiculously Rich to share documents, videos, and other downloadable resources with their Ambassadors and Cakepreneurs all over the country. A 'Stockists' page (view here) that makes it easy for users to find nearby shops that sell Ridiculously Rich cakes. A new 'Find My Nearest' page (view here) - simply enter your postcode to see a full list of Ridiculously Rich Ambassadors and Cakepreneurs in your area. Robert D. Johnson Funeral Directors are an independent funeral service based in Barry, Vale of Glamorgan. This family-run business specialises in bespoke, flexible funeral services for families who are looking to make arrangements after the passing of a loved one. With extensive experience in funeral care, they ensure every family receives the service they’ve envisioned for their dearly departed – while alleviating them of the stress of organising the funeral arrangements during their period of grief. As an independent business, Robert D. Johnson offer a caring, personal service that large chains are sometimes unable to provide. Staff are selected on the basis of their professionalism and caring approach to their work. We have created a user-friendly brochure website for Robert D. Johnson Funeral Directors. The new design is professional and befitting of the industry in which this client operates, and the website interface is very easy for users to navigate. Visit www.rjfunerals.co.uk to take a look at our work. Responsive Website Design – The RJ Funerals website functions well across all screen sizes whilst maintaining its sophisticated look. Regardless of the device used to access the website, the pages of the website maintain their look and ease of navigation. Search Engine Optimisation – Every page on the new RJ Funerals website features high-quality content which is relevant to the user, effective in communicating the services offered, and carefully optimised for high Google rankings. Do you need a bespoke, professional website to showcase your business and the services you offer? If so, get in touch with Designer Websites for a free, no-obligation quote. The website itself has a user-friendly design that adapts to the screen it's viewed on, allowing adventurers of all stripes to make purchases on the go using their smartphones. In addition to the secure online checkout system, this site includes the option to pay in three different currencies (pounds, euros and Emirati dirhams), enabling the company to sell their products to a huge international market. Visit Life-Gear.com now to browse the website for yourself, or click here to request a quotation for your own ecommerce web design project. With clinics located in Barry, Canton and Whitchurch, and physiotherapists boasting BSc (Hons) degrees, postgraduate training and Chartered Society of Physiotherapists / Health Professional Council accreditation, David Bolwell Physiotherapy Services is one of the top physio clinics in South Wales. They possess extensive experience and provide treatments dealing with muscle, soft tissue and joint conditions, as well as post-surgery rehabilitation and sports injuries. DB Physio Services asked us to give their old brochure website an enhanced look and feel, paying particular attention to the website’s usability on a number of devices and the ability to send enquiries with ease. We’re proud to announce that DB Physio’s new and updated website is now live – visit https://www.dbphysio.co.uk/ to see the new design. Responsive Design – A key aim of the new website was to allow users on varying devices with different screen sizes to experience the same great design. The new DB Physio website now possesses a fully responsive design that works well and looks great on any device. SEO – The need for high-quality content is imperative for any brochure website. We optimised each page of the new website and helped DB Physio to create information, high-quality content in order to rank highly on search engines like Google. Enhanced User Interface – The new DB Physio website allows the user to make a swift and detailed treatment enquiry. The updated enquiry form contains that ability to select the user’s preferred clinic and appointment date/time. If you are in need of a professional-looking website for your business, please do not hesitate to get in touch with the team at Designer Websites. Request a FREE, no-obligation quote for your project here. Why did Ultrasound Plus come to us? Ultrasound Plus came to us because they needed a new website with a significantly improved customer experience, and an optimised website to improve their online visibility. We designed a brand-new website with a clear target of maximising customer engagement and improving rankings on the major search engines. Click here to view the new and improved website. If you require a professional-looking website for your business, that is easy to navigate on any device, then get in touch with our team here at Designer Websites on 01446 339050 or request a free, no-obligation quote.